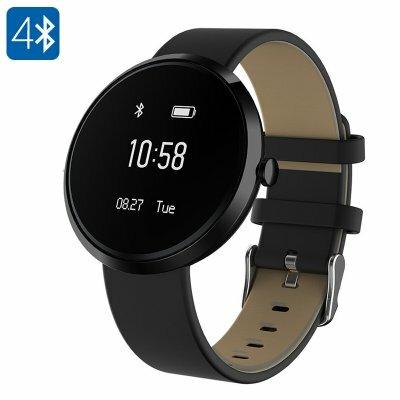 Successfully Added Ordro S10 Smart Sport Bracelet - Heart Rate Monitor, Blood Pressure, Sleep Monitor, Pedometer, Bluetooth, Calorie Counter(Black) to your Shopping Cart. The Ordro S10 Smart Sport Bracelet allows you to carry along your own personal trainer at any time. Featuring an abundance of sport and health features, this health accessory is sure to motivate you and improve your current health standards. Supporting Bluetooth, this sports watch can additionally be paired with your smartphone, allowing you to sync all its data and to receive notifications of incoming calls and messages. Packing its own highly accurate heart rate monitor, this sports watch does not only keep track of your heart rate during exercise, it also allows you to test the current status of your heart while resting. Not only does this give you a great insight of your current stamina level, it also provides you with a basis on which to improve your health condition. Besides testing your heart rate this magnificent sports accessory also allows you to test your blood pressure, providing you with even more data on your current health and stamina levels. Thanks to its weatherproof rating, this waterproof sports watch allows you to head out and workout to improve your heart rate and blood pressure alike no matter the weather conditions. From now on a little bit of rain will no longer be an excuse to skip your upcoming exercise session. Its built-in pedometer keeps track off all the steps you make during your workout or regular day out. Not only does this give you a great insight of how active you were throughout the day, it also counts the calories you have burned – giving you a great overview of whether you’re hitting your current exercise goals. Along with its sleep monitor, the Ordo S10 Sports Bracelet does not only motivate you while working out, but it also ensures that you get enough rest for a fast and healthy recovery after each of your workouts. With this personalized electronic gadget at your wrist you can be assured that, from now on, you’ll always get the amount of exercise and rest needed – allowing you to reach your future exercise goals in no time. Featuring an extra bright 0.95 inch OLED display, this smart sports accessory provides you with clear and sharp images – making sure that you’ll be able to read the displayed data even whilst under direct sunlight. When paired with your smartphone, this sports watch notifies you about incoming phone calls and messages, ensuring that even during your workout, you’ll never miss an important call again. Along with its 100mAh battery, this health gadget will keep on running for 5 days in a row on standby, providing you with tons of exercise data and motivation without needing to worry about running out of juice mid-workout. The Ordro S10 Smart Sport Bracelet comes with a 12 months warranty, brought to you by the leader in electronic devices as well as wholesale electronic gadgets..